BIG SUR, Calif. - Firefighters struggled Thursday to get the upper hand on a massive wildfire along Northern California's picturesque Big Sur coastline, where anxious residents awaited word on their homes and popular parks and trails closed at the height of tourist season. The blaze spanning 42 square miles has destroyed 34 homes, forced the evacuation of 350 properties and put at least 2,000 buildings at risk. A 35-year-old father of two girls also was killed this week when the bulldozer he was operating rolled over on the fire lines. 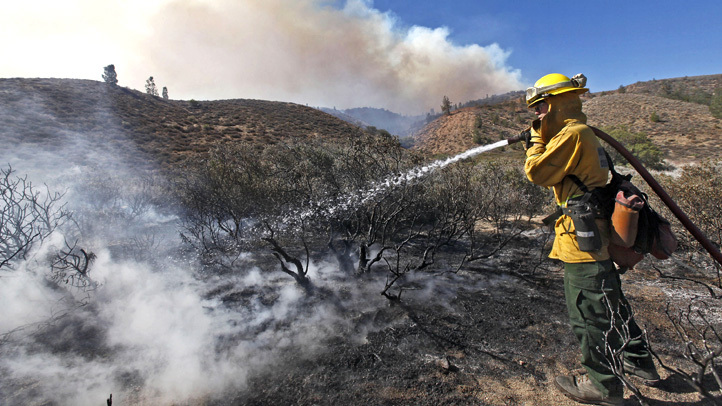 California Department of Forestry and Fire Protection estimated it will take until the end of August to extinguish a blaze that also led to the rescue of 11 hikers, some of whom authorities suspected of tending to an illegal marijuana patch of 900 plants. No arrests were made. Firefighters worked in rugged terrain near coastal Highway 1 in an area that draws tourists from around the world for the dramatic vistas of ocean and mountains. The famous roadway remained open, but smoke and the threat of flames forced the closure of state parks near Big Sur, a big economic driver for the region. Tom and Donna Huntington, both 65, have lived for 29 years in the community of Palo Colorado, which was hard-hit by the fire. They evacuated their home last Friday and have been staying with friends and a Red Cross shelter at a school. The bulldozer operator who died on the fire lines this week was identified Thursday as Robert Reagan. The Fresno County man's sister, Hannah Cunnings, told The Associated Press that her brother was the kind of person who would offer to put snow chains on your car or fix an engine that needed repair. ``Even since he was a boy, he just really wanted to help people,'' she said, crying. Cunnings said her brother and his wife also cared for a young niece. Reagan became the second person killed during wildfires burning in two parts of the state. The other death came last Saturday in Southern California when the burned body of 67-year-old Robert Bresnick was found in a car after he refused to leave a house, authorities said. Crews stopped the spread of that nearly 60-square-mile wildfire, which destroyed 18 homes in mountains and canyons outside Los Angeles. In the north, four people who hiked out of the fire area earlier this week acknowledged illegally growing marijuana for the last three months, Monterey County sheriff's Sgt. Kathy Palazzolo said. It's illegal to grow marijuana in California except for medicinal purposes, but pot grows are common throughout coastal Monterey County, south of San Francisco. ``We have them all over, all throughout the county, in the national forest, on private property, in riverbeds, we find them all over,'' Palazzolo said. Separately, a group of seven people were rescued Tuesday after calling 911, Palazzolo said. They denied cultivating the plant and said they were backcountry hikers, but a deputy wrote in a preliminary report that he did not believe them. There was no evidence to suggest the fire was sparked by marijuana cultivation, but authorities were still investigating what did, Cal Fire spokesman Robert Fish said. The blaze was just partially contained.